A credible step into the future and proof that, after over half a century, the Vox spirit of innovation is still very much alive. Hard to find fault - there’s no effects loop, but this type of clean amp doesn’t really need one. One of the hottest product launches at this year’s Winter NAMM was also one of the smallest. 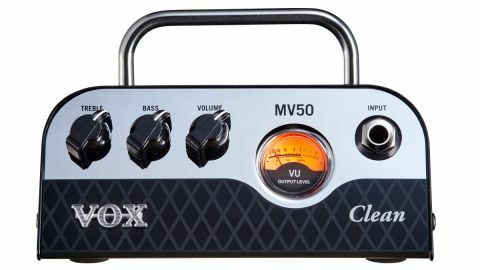 Vox’s new MV50 heads are not much bigger than a stompbox and come in three different flavours: Clean, AC and Rock. Clean is based on classic American amps from the 1960s, and this is the model that we’re looking at today. While Class D power delivers a maximum of 50 watts into a four-ohm load, the real revolution is in the preamp. The MV50s use valves - not just any valve but a new design called the Nutube 6P1: a clever bit of lateral thinking by Vox owners, Korg that uses a tiny fraction of the energy of a 12AX7. This lil’ valve was first announced at the Winter NAMM show of 2015 with a couple of relatively low-key prototype demos to test the water. However, anticipation has ramped up with the arrival of these MV50s at this year’s show. All three MV50s have the same black and chrome steel chassis; a diamond-shaped window on the top shows off the neat 6P1 valve, while the control panel’s main feature is a backlit VU meter. Removing four small machine screws releases the lid, exposing a miniature work of production engineering art, where practically every cubic centimetre of space is filled with something. Four smart red PCBs support a mix of surface mount and miniature discrete components, with the 6P1 (sat on its own board) piggybacked over the main PCB. It’s supported on anti-shock mounts and connected with a multi-pin plug, making replacement straightforward if needed. Under a magnifying glass, it’s just possible to make out the 6P1’s single wire cathode and the lattice of the control grid. Along with a single input jack, the amp has three mini chickenhead knobs, used for treble, bass and volume. The rear panel features a speaker-emulated headphone/recording output and an EQ switch that changes the output from a flat response, intended for large cabinets, to an enhanced bass lift that works with the MV50’s partner cabinet, the specially designed BC108. There’s also a three-way attenuator providing a choice of full, 1/10 or 1/100 power options. We like the raked-back control panel and colour-coded diamond pattern behind the famous Vox logo, which gives the MV50 a distinctive retro- modern look, with a tiny hint of Spinal Tap ‘Mr Horsepower’ from the VU meter that’s sure to appeal to many players. The MV50 is exceptionally quiet, with very low hiss levels and zero hum, thanks to the external DC power adaptor. You might think with only three controls on the front panel you’d be somewhat limited in terms of tonal range, but that’s not the case. This amp is perfectly dialled in. The MV50 Clean produces sparkling, syrupy- sweet highs and a round, punchy bass that typifies the ‘blackface’ sound. Pushed hard, with the volume control up to around three quarters, there’s a subtle edge that’s great for blues, country or jazz. The addictive response of these heads feels ‘real’. You’re not plugged into a digital facsimile; these are proper amps, illustrated by the 6P1’s anodes flickering as you play. Real valve dynamics kick harder when you dig in, with tons of harmonic overtones, and sweeten up as you back off the guitar’s volume. There’s plenty of power on tap; the specially designed ported BC108 cab is amazingly loud for its size and very usable for lower-powered gigs, while plugging the MV50 into a 4x12 unleashes sufficient volume levels for most small pub gigs. For home recording, you can disconnect the speaker and use the excellent headphone/line out for pro-standard results. We really think this MV50 could turn out to be one of the most popular modern Vox designs. There’s no channel switching, digital effects or loops, but what you do get is serious tone that holds its own in any environment with enough power for recording, rehearsal and small gigs, in a package no bigger and no more expensive than a high-quality stompbox. From beginner to pro, the 6P1-powered MV50 could very well turn out to be a game-changer.